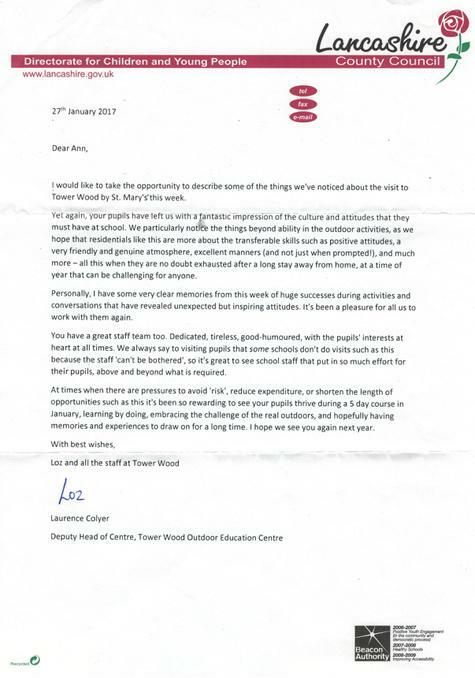 It was lovely to receive the attached letter from the Deputy Head from Tower Wood. In addition to this letter, were all the positive comments that myself and the rest of St Mary's Staff received whilst we were at Tower Wood. During this special week the children 'grew' in ways that are totally immeasurable and in the process have made memories that will stay with them for a life time. Well done to all the children - you were fantastic. A big thank you to Mrs Sewell, Mrs Bradford, 'Auntie Ann' and Mr Woodward for making the trip possible.